Water expands as it freezes. This expansion puts extreme pressure on whatever is containing it, including metal or plastic pipes. 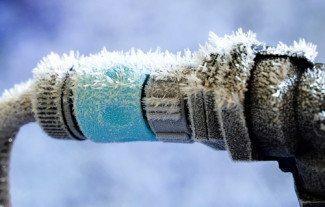 Pipes that freeze most frequently are those that are exposed to severe cold, like outdoor water faucets, swimming pool supply lines, water sprinkler lines, and water supply pipes in unheated interior areas like basements and crawl spaces, attics, garages, or kitchen cabinets. Pipes that run against exterior walls that have little or no insulation are also subject to freezing. Check the insulation of pipes in your home’s crawl spaces and attic. Exposed pipes are most susceptible to freezing. With severe cold, even a tiny opening can let in enough cold air to cause a pipe to freeze. If you turn on your faucets and nothing comes out, leave the faucets turned on and call a plumber.If your house or basement is flooding, turn off the water valve and immediately call 911. Make sure everyone in your family knows where the water shutoff valve is and how to open and close it. Likely places for the water turn-off valve include internal pipes running against exterior walls or where water service enters a home through the foundation.